Blaze Pizza, the recognized world leader in fast, artisanal pizza, is looking to add to our team of top-tier franchise partners. Recently ranked as the number one pizza brand in America in a leading consumer poll and as the number one brand of the year by Fast Casual magazine in 2017, we're excited to be opening up several new major markets to fuel our expansion. Our Franchise Development Team is ready to meet with experienced multi-unit developers in Dallas, Cleveland, Houston, San Francisco, Philadelphia, Virginia and Indianapolis. BLAZE FAST-FIRE'D PIZZA is a modern day "pizza joint" serving up artisanal pizzas that are both fast and affordable. Since its first restaurant debuted in 2012, Blaze has quickly become one of the nation's hottest restaurant concepts, with fans lining up each day for its custom-built pizzas, freshly made salads, house made lemonades and signature s'more pies. Blaze's obsessive attention to detail extends well beyond the food, with a carefully-considered, modern approach to restaurant design. Driven by its commitment to "Intelligent Choices for Our Pizzas, People & Planet," the restaurant is constructed with recycled and sustainable materials, uses eco-friendly packaging, and features energy-efficient LED lighting. Start With A Spark. Build A Blaze. We are currently partnering with multi-unit franchisees to build a large footprint of restaurants across the U.S. and in Canada. We're primarily interested in centers that service both lunch/daytime traffic and dinner/nighttime traffic (residential and entertainment). 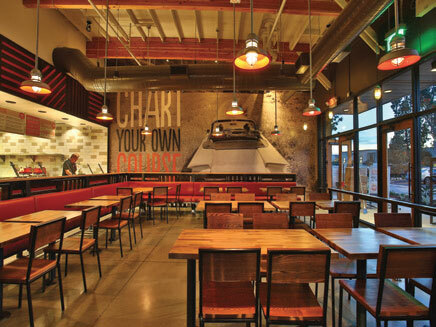 We prefer co-tenancy with similar contemporary fast-casual brands (think Chipotle, Five Guys and Panera Bread). Want in? Complete the interest form using the link below and learn more about the most beloved pizza brand in the country!